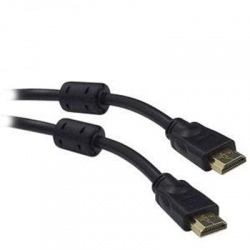 HDMI (High Definition Multimedia Interface) is a specification that combines video and audio into a single digital interface for use with digital versatile disc (DVD) players? digital television (DTV) players? set-top boxes? and other audiovisual devices. The basis for HDMI is High Bandwidth Digital Content Protection (HDCP) and the core technology of Digital Visual Interface (DVI). HDCP is an Intel specification used to protect digital content transmitted and received by DVI-compliant displays. HDMI supports standard? enhanced? or high-definition video plus standard to multi-channel surround-sound audio. HDMI benefits include uncompressed digital video? a bandwidth of up to 5 gigabytes per second? one connector instead of several cables and connectors? and communication between the video source and the DTV. HDMI development is overseen by the HDMI Working Group that includes Sony? Hitachi? Silicon Image? Philips? and Toshiba as members.